Birth control pills: How do you choose? Things change with the seasons. New shoes. New tunes. New birth control pill. Wait–what? 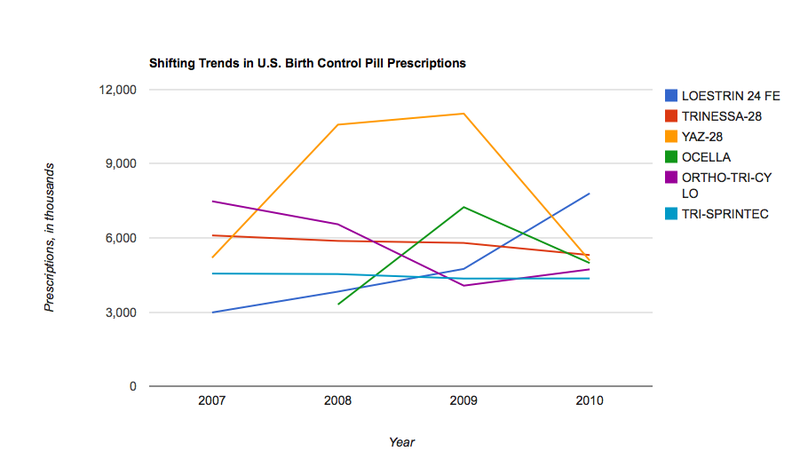 Birth control pills are multi-billion-dollar industry, and, as in many other industries, trends, and prices, shift. We took a look at some data from IMS Health on the most popular birth control pill, and were surprised to see how much it fluctuated from year to year. One of the biggest shifts on the chart is the precipitous rise and fall of Yaz. Until recently, Yaz was the most-prescribed birth control pill in America. Made by Bayer, Yaz came onto the market in 2006. It billed itself as a new, better pill. Early ads implied that, in addition to keeping babies at bay, the pill could improve moods and clear up skin. was the most popular oral contraceptive among U.S. girls ages 13 to 18. It became Bayer’s best-selling pharmaceutical. A 2010 annual report shows it brought in about $1.47 billion in worldwide sales last year. Big sales come in part from popularity, and in part from cost. Yaz is quite expensive (around $80 to $105 per month for those who pay out of pocket). The generic versions, which came on the market last year, are pricey too. In 2009, the Food and Drug Administration required Bayer to run ads in some states to correct misconceptions from Yaz’s early ads. Some women also found they had bad reactions to the pill, which they believe contributed to blood clots. In September, 2010, an 18-year-old who was taking Yaz for acne died of a pulmonary embolism. Her family said it believed the death was linked to her use of Yaz, and they sued. There are now more than 8,000 lawsuits in the U.S. against Bayer and two other companies that make generic versions of the drug, brought by people who say they were ill-informed of the drug’s potential dangers. The F.D.A. has been looking into safety risks related ot Yaz and other birth control pills that contain drospirenone, a synthetic form of the hormone progesterone. At the end of May, the FDA announced that two British studies suggested pills with drospirenone cause a greater risk of blood clots than other birth control pills (all carry some risk). The agency has commissioned an 800,000-user study of the drug, and plans to release results later this summer. Bayer has taken a pretty big hit, with sales falling 18 percent this year from the same period in 2010, according to the company’s most recent quarterly report. That’s on top of a 52 percent drop between 2009 and 2010, data from IMS Health shows. And according to the numbers from IMS, there’s a new player in town: LoEstrin. This new pill has risen slowly but steadily. Could this be the next big player?